Imagine gazing into a pond filled with gloriously colorful, vibrant fish. Now imagine this scene is just yards from your house. Sounds like a dream, right? Actually, it’s a reality, and it’s closer than you might think. A small investment in some koi fish eggs and you could be well on your way to crafting the perfect Technicolor dreamscape, right in your own backyard. 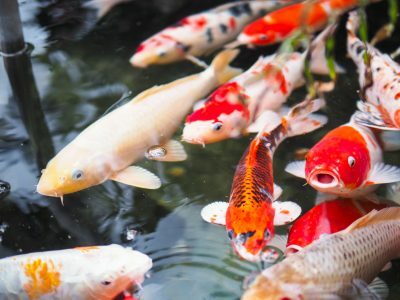 Koi ponds are an excellent addition to almost any landscape, filled with fish so rich and vivid in pigment the Japanese call them Nishikigoi, or “living jewels.” Yet, while some jumbo koi can grow up to three feet in length, you’ll want to start a little smaller when you’re creating your pond. That’s where the eggs come in. Everything is a process, and starting a koi pond is no exception. Read on for some tips on turning those sweet koi fish eggs into a living, breathing art exhibit right at home. To begin, you’ll want to research the best place to buy koi carp in your area. Your local pet store or aquarium supply store is a great place to start. In essence, to create koi fish eggs, all you need to begin is a male koi and a female koi. Not sure how to tell the two apart? Here’s a handy guide. Aim for fish that are least three years old, as fertility and maturity are at their height around this age. While some females can produce koi fish eggs at 15 years old, around six years old is when they’ve generally reached their capacity. Once you’ve established that you have the right pair, creating a pond full of rainbow babies won’t happen overnight. In fact, it might not happen even after a few tries. To up your likelihood of success, it’s important to understand just how koi fish eggs come to be. It all begins with a process called spawning. Put simply, spawning begins when a female koi becomes filled with eggs. After she lays them, the male koi will fertilize them and the baby koi will begin to grow. Sounds pretty simple, right? Actually, koi can be fairly fickle creatures when it comes to reproducing. If the environment isn’t particularly to their taste and the timing is off, they might even skip it altogether, at least for a season. 1. Get them in shape. It’s plain and simple: Healthy koi fish eggs require healthy parents. If you’re looking to up your odds of having a strong, robust school of baby koi, you’ll need to get the adults in tip-top shape first. Feed them protein-rich foods as mating season approaches, while in other seasons, such as late fall, they benefit more from carbohydrate-rich foods. No playing hard to get here! When the female fish is full of eggs, she will omit a signature scent and her abdomen will begin to will swell. Around this same time, male koi carp will ready themselves to mate. They’ll begin swimming toward the female koi. While this can initially be perceived as a relatively friendly move, it can quickly turn aggressive. Male fish may begin to push the female fish into obstacles, such as the pond’s edge, to force her to release her eggs. 3. Make sure your water is clear. Experts recommend draining out 10% to 20% of your pond around once a week and replacing it with fresh water. The idea here is to not only compensate for the water that’s evaporating off of your pond, but to also prevent harmful bacteria, like ammonia, from building up within it. 4. Wait for the right time. Koi carp tend to spawn when the temperature in the pond is between 65 degrees and 70 degrees. In many areas, this means late spring to early summer is the perfect season to encourage the process. Another advantage of this timeframe is the longer daylight hours, which can also trigger spawning. 5. Allow for some privacy. A watched pot never boils, right? This also applies to koi spawning. Most koi prefer to spawn away from view, in a darker, more obscure place than wide out in the open. A strategically placed plant, rock, or even fish shelter can serve as an excellent hiding and mating spot. Since it’s often done in the private eye and quite quickly (around 20 to 30 minutes), you might not be able to tell if and when spawning has occurred. One sign to look for: a frothy texture on the top of the water’s surface. After the female lays the koi fish eggs, the male will find them and fertilize them. This might take just a little time, though, for one simple reason: Female koi don’t lay all their eggs in one place. In fact, they often spread the eggs all throughout the pond, on the walls, on the bottom, and on any plants around. If you’d like to make the process more streamlined, you can purchase equipment known as “spawning ropes” that can be placed around the pond in a preferred direction. In about two to five days, the eggs will begin to hatch, and baby koi, known as “fry” will emerge. After her part is complete, the female koi will begin creating new eggs. These will be laid in about a year’s time, as that’s how long it takes for them develop. So you’ve got your eggs. In fact, you’ve got a lot of eggs. Female koi carp can produce up to 100,000 eggs per 1 kilogram of their body weight. Now what? Even after all the challenge of spawning is over, the baby fish eggs are still not in the clear just yet. Not only could other koi (even their own parents) potentially eat the koi fish eggs, and the fry that emerge from them, they’re also liable to be snatched by another predator, such as a passing frog. To make sure yours aren’t gobbled up within seconds of their birth, you’ll need to get them to a safe place — fast. Remember those aquatic plants you planted in your pond to give your fish some privacy while they spawned? Those will come in handy again now. Move the fish, to the best of your ability, so their dark and shady leaves can shroud them from danger. Another safe spot is behind a rock or within a crevice of your pond. You can also purchase pond supplies, such as a pond reef, specifically designed to provide a safe space for the koi to swim and explore. If creating a safe environment within the pond is too difficult in your situation, you can also move the newly hatched eggs into a separate holding tank. Here, you can make sure the water temperature and quality are consistent and accurate to encourage your koi fish eggs to grow into healthy and strong little swimmers! Once the koi fish eggs hatch, they’ll attach themselves to the side of the pond, and a few days after that they try out their sea legs and go swimming for the first time. By the time they’ve reached about three inches, the fry are considered out of the “danger zone” of predation and, for the most part, are free to roam about the pond as they explore their new surroundings. Initially, the koi fry can live off of their egg yolk. However, they’ll soon need nutrients that only you, their faithful guardian, can provide. Start small, with liquid or suspended-particle food, then work your way up to more solid foods. When they’re full grown, you can even expand your koi’s diet to include certain human foods, such as hard-boiled eggs! A rule of thumb to keep in mind when feeding is to make sure even the smallest fry in the group can eat the particle you’re giving them. Expect to feed your koi fry about 2-4 times per day at first, spacing the feedings out a little bit more the older they get. How often and what types of food you feed your fry will be determined primarily by your water temperature, but around 1% to 2% of their body weight, each day, is a good place to start. As the fry grow, they’ll soon be ready to begin the spawning process themselves, and the process can begin all over again. From tiny, translucent koi fish eggs can come an incredibly beautiful, rewarding result. The key is taking the time to prepare, then following all the required steps along the journey. We understand the details can become as muddy as the dirt on your pond floor, but the good news is you don’t have to do it alone. From lake and pond management to fish health assessments, we’re here to make sure that you’ve got everything you need for a successful, enjoyable pond experience. 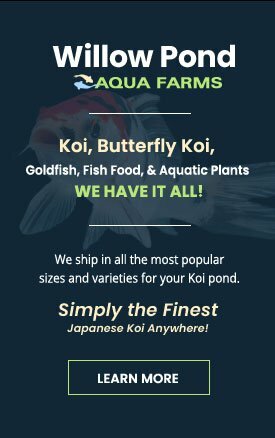 If you’re ready to start creating and stocking your koi fish pond, we’d love to help. Feel free to contact us, browse our blog archive, or leave a comment below and let’s dive in!